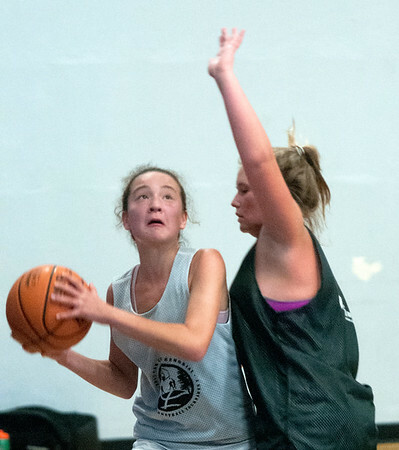 JIM VAIKNORAS/Staff photo Alana Olsen drives to the basket while guarded by Jenna Bard at the Cam Coye 3on3 basketball tournament at Georgetown High School Saturday. 170812JVA3on33 on 3 backetball Cam Coye 3on3 basketball tournament at American Legion Park in Georgetown. Will have 200 kids there playing all dayso don't have to go at 10 a.m.but I will likely go around then. LUCKY the Celtics mascot will be there at 10 a.m. 45 shots would be great.